I mentioned in last week’s post that we have two new seventh dans. One of them is my old friend John O’Sullivan whose success is richly deserved. John passed the examination at his 15th attempt, a feat that deserves praise for sheer grit and determination, but what impressed me more was that at the age of 70 he was able to completely change his approach to kendo. John is a kendo veteran with 40 or so years of kendo behind him. He had previously practised aikido and played rugby. As you can imagine, he is immensely competitive and this will to win sometimes resulted in a defensive approach to kendo. He is also a big, strong individual and has tended to sometimes rely on his physical strength in keiko. As most of you know, there are no honorary grades in kendo. No concessions are made for age, infirmity or services to kendo. You either demonstrate that you meet the standard against your opponents on the day or you stay where you are. John has obviously been reflecting on past grading exams and thinking about the changes he needed to make. A few months ago he attended Ozawa sensei’s seminar and was given the advice that he needed to continue forward after striking men rather than hitting and stopping. With that in mind he has been using me for target practice as part of our weekly keiko. We were regularly working on men drills and although most of what we were doing was correct, something was not working properly. After a few sessions I noticed that as he stepped in to make seme, he was dropping the point of his shinai. This not only gave a clear indication that he intended to attack, but also resulted in his balance being on the front foot as he attacked, which meant that he was leaning forward after the strike. 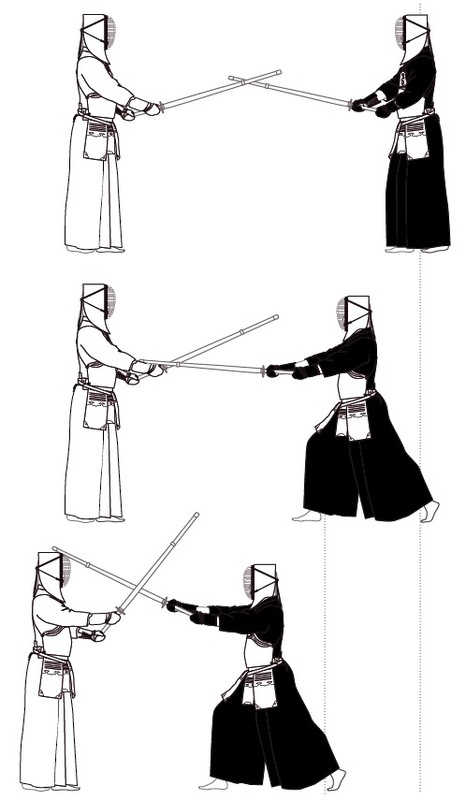 Like many things in kendo you can argue which was cause and which was effect. Lack of hikitsuke could result in the point dipping or vice versa but from John’s perspective the road to Damascus lay in the realisation that he was dropping the point. At the examination he started pretty much the same way as he has done in previous gradings, the then pushed off to take an immaculate debana men followed by three steps forward and a turn back to engage with his partner. He then did the same again before the call of yame. With his second opponent he pretty much repeated the process. Although a panellist for the 4th and 5th dan examination which happened at the same time, I was fortunate enough to finish in time to see both his tachiai. I also had to walk past the table where the results were collated and could see that he was not only one of the 4 successful candidates out of 22, but that he had pass marks from all six judges. Who says you can’t teach an old dog new tricks. Well done mate! Many years ago in the early days of British kendo, a friend told me that his success in shiai was the result of his secret weapon, kote-men-dou. The idea was that this pre-planned renzoku waza sequence would invariably fool his opponents into lifting their arms to protect men and they would leave their dou open. At that time many of us were of a level where the technique actually worked, but with time and experience, far fewer people would fall for it today. To be frank, I am not a believer in planning, at least not in a kendo context. “Fail to plan; plan to fail” may be a valuable adage in business administration, but in kendo the aim is to strike instinctively. So although we should of course build up our ability to make continuous attacks through kote-men, and kote-men-dou drills, these are not set-pieces. To my mind there are only four techniques in kendo – men, dou, kote and tsuki. There are of course infinite possibilities as to how these waza are applied, depending on distance, timing and opportunity. Whether you strike men as an oji-waza or shikake technique, the objective is still to hit your opponent on the head. Renzoku waza are not pre-ordained sequences, they are more a matter of you attacking a target without success, but because you are moving forward in full spirit, you have the ability to continue immediately to attack another target because your first strike broke your opponent’s composure, causing one or more of the four kendo sicknesses, kyo-ku-gi-waku, (surprise, fear, doubt and hesitation). Of course, if your adversary continues to keep a level mind, then there is no point in launching a second attack. Renzoku waza depend on good footwork and posture. You should be in the habit of bringing your left foot up in hikitsuke as soon as you make fumikomi with the right and be ready to push off again from the left as soon as you have an opportunity. Breathing needs to be correct: you must keep breath in your tanden throughout the sequence. This is one area where regular correct kirikaeshi practice helps prepare you. It might be argued that you do not see renzoku waza often in high level, 8th dan tachiai. This is not because high grades can’t do renzoku waza, in fact some senior teachers such as Yamanaka sensei are experts. It is more a matter of their opponent keeping a strong kamae so that there is no opportunity to launch a second or third attack. Following last week’s post, several people asked if I knew of any specific drills to help develop debana men. There are two that are worth trying. Which you use depends on your level of kendo experience. Both should be practised against a partner who acts as motodachi. The first is for less experienced kendoka. You should start by taking chudan kamae and move into your own uchima striking distance. Motodachi then takes one hand of his shinai and pushes the palm of his kote against the tip of you shinai. You should ensure that your feet are in the correct position, paying particular attention to quickly drawing up your left foot. Make sure that your left heel is slightly raised off the ground and that there is a feeling of tension behind your left knee. You should have taken a breath before your step into distance and as we discussed last week, let half of it out as kakegoe. Keeping the remaining air in your abdomen and making sure that hands and arms relaxed, you should push against motodachi’s hand using the pressure of your hips and back. When motodachi decides that the time is right, he pulls his hand away. You should be able to strike instantly by pushing off from your back foot. This exercise will help some people understand the feeling of pressure even if they are not quite ready to appreciate the force exuded by a strong opponent’s kigamae. For more experienced kenshi a similar drill can be used, but motodachi should not physically touch kakarite’s shinai. Instead kakarite observes the same precautions about breathing, posture and hikitsuke, but this time it is the force of motodachi’s kamae that holds them at bay. Motodachi makes the chance to strike, obviously breaking the tension by slightly raising the shinai and inclining his head forward. He should pay particular attention to vary the timing of each striking opportunity. If this is done correctly motodachi gets as much out of it as does kakarite, as he can experience the “feeling” of the opportunity as he makes and breaks “mind contact” with kakarite. The third drill in this series is where motodachi picks the opportunity to strike men and commits to making the attack. Kakarite responds with debana men. I would not recommend this for anyone but the most experienced, as there is a tendency for motodachi to change the timing of the attack to beat kakarite’s strike. No-one does this intentionally, but our competitive inner selves have a tendency to take over. 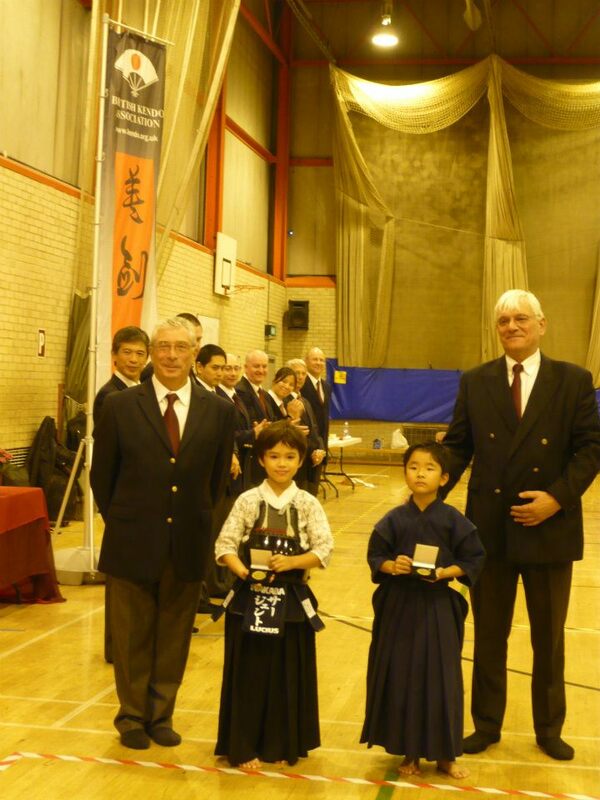 I was asked to give some advice on performance at shiai training in preparation for this weekend’s London cup. I won’t say at which dojo or on which day this took place, otherwise I might give away the secrets of their shiai preparation. During most of the shiai, the one single element that made the difference between achieving ippon and failing was hikitsuke. So in the interests of fairness, I will share some advice on this with all prospective competitors; well at least those who read my blog. In kendo hikitsuke means to pull the left foot up to the correct position (left toes in line with the right heel), in readiness to make an instant strike. In everyday Japanese it can also mean to attract or fascinate, but that is another story. Coming back to the point, when you move forward in kendo your left heel should be off the ground so that your foot is at a 15 degree angle with the floor. 70% of your weight should be on the left foot and 70% of that weight concentrated on the ball of the foot. You push from this foot to move, sliding the right foot forward and instantly bringing the left foot into position to repeat the action. When you attack, you should use this action to push off instantly and strike as soon as you see or make an opportunity. In theory simple, but most people at shiai practice were not doing this; instead either their left leg trailed impotently behind, because the left foot angle was too high, or the left foot was flat on the floor so the left leg remained in place as the right foot moved forward. The repercussions for both of these mistakes was that it was not possible to make sufficient forward distance to hit men cleanly with the datotsu-bu of the shinai, or because of the need to compensate by leaning forward or turning the body to make distance, the attacker was not able to strike with good posture and zanshin. End result – no ippon. This lack of left foot traction was also evident when some fighters stepped back, allowing the heel to sink down to the ground. This action mades them an obvious victim to hikibana man. As I have repeatedly been told, successful shiai depends on good basics. Good basics depend on lots of keiko, so that when you see the golden opportunity to hit the target that wins your shiai, you do not have to think about it. You just let your left foot decide. I do not often teach beginners, but I do notice from time to time that individuals who are now well past the first stages of learning kendo, still have problems in making correct fumikomi. Teaching at the last seminar in Ireland was illuminating as there were a number of new kendoka who were working very hard to establish the basis of good kendo foot movement. This made me reflect on how important it is to perfect the basics before you can move on to learn more complex kendo technique. Certainly from a western perspective the concept of suri ashi, (sliding feet) and okuri ashi, (moving the foot facing the direction you move in) is alien: We learn to walk heel- toe, lifting the leg from the knee and transferring the weight from the back to the front of the foot. Kendo foot movement developed in Japan at a time when people were used to wearing geta and zori and needed to slide their feet forward. The repercussions of heel toe walking are still obvious, with many beginners instinctively pulling from the front foot rather than pushing from the back foot. The key points to remember are that the back leg should be tense with the heel only slightly raised, (just 15 degrees). The knee of the front leg should be slightly bent and the foot should be parallel to the ground, as if a thin sheet of paper were between it and the floor. In the words of Matsumoto Toshio sensei, the movement should be, “like a cat walking”. Everyone is taught that the toes of the left foot should be in line with the heel of the right and that there should be a fist’s distance in width between them. I think that this can vary. If you have sufficient leg power, then there is no reason why your feet should not be further apart. The width between them should also depend on your own body shape and size. What I am trying to say is that your feet should be in a position that feels comfortable and stable. In my view, the most important element is hikitsuke, the process of drawing the back foot to its relative position with the front foot as soon as you move forward or make fumikomi to strike. In this way you maintain balance and the ability to move forward instantly.